Sometimes a pancake is just a pancake. 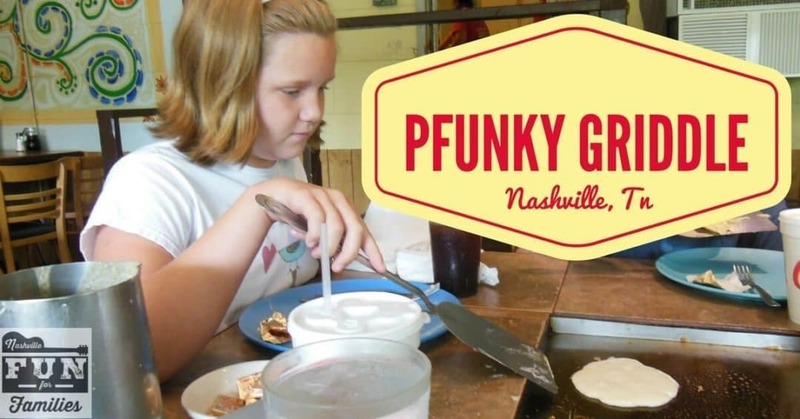 But at the Pfunky Griddle, pancakes are family fun! Our kids LOVE this place. And so do many Nashvillians so be prepared. There can be a very long wait on weekends. The earlier you get there, the better chance you will have a short wait. We visited on a weekday morning and our party of 9 was immediately seated (this rarely happens to us). Menus were handed around and after our drinks were ordered and brought back our server explained how the griddle worked. Two types of batter are brought to the table and will be refilled until you have had as much pancake goodness as you can handle. You get unbleached white batter and an organic 5 grain which had wheat, corn, and other grains. Gluten Free batter is available. The homemade maple syrup was great too! The real fun comes with the toppings – there are 25 to choose from. One topping is included for kids 4+ and adults and additional toppings can be purchased for 75 cents each. Here is the full list of choices. Once everything arrived at our table the pancake making fun began. Several of our kids had never made pancakes on their own. It was really fun watching them learn how to use a spatula and create pancake shapes. We did learn that the batter does stick so be sure to spray your griddle with the provided non-stick spray between each set of pancakes. Never fear if you are not a pancake fan – you can still enjoy the griddle. Pfunky Griddle will provide eggs, savory omelet type toppings and potatoes to make hash-browns. If you come for lunch you can order bread and cheese and make your own grilled cheese sandwich. If you want your food cooked for you there is a large list of salads, soups and sandwiches that will be prepared for you. 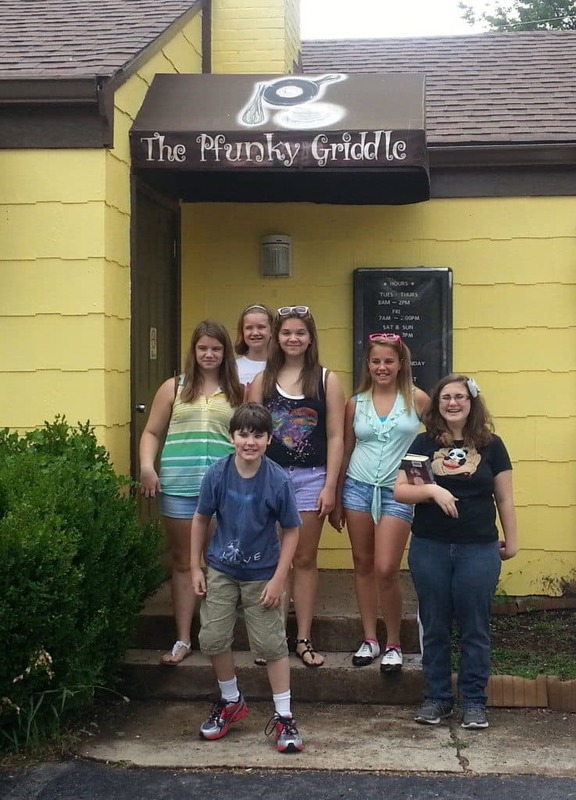 Next time you want to treat your kids consider a visit to the Pfunky Griddle – it sure made our kids happy! See Griddle Menu and Off the Griddle Menu for full pricing info.